"I paid $250 for this recipe. Pass it on!" From time to time I have been asked to provide a recipe for Red Velvet Cake. I had not baked one for years. And a search of my considerable cookbook library revealed not one single recipe for Red Velvet Cake. So I implemented an Internet search which yielded an astonishing number of recipes for this colorful creation. The same search turned up the bogus but persistent Neiman Marcus cookie hoax which, in one form or another, I had been hearing for years, up to and including an email I received recently. There is a connection. Despite the dozens of recipes I found, there were many variations among them. So armed with the mountain of sometimes conflicting information that only the Internet can provide, I went to my kitchen and got out the mixer. The origin of Red Velvet Cake goes back to the Waldorf Astoria Hotel. This cake has been a popular favorite for years especially, but not exclusively, in the Southern states. If you saw "Steel Magnolias," you may recall mention of the armadillo groom's cake with the blood-red interior. That could only be a Red Velvet Cake. Actually, Red Velvet Cake is a beautifully textured cake with a mild chocolate flavor that just happens to be startlingly red. 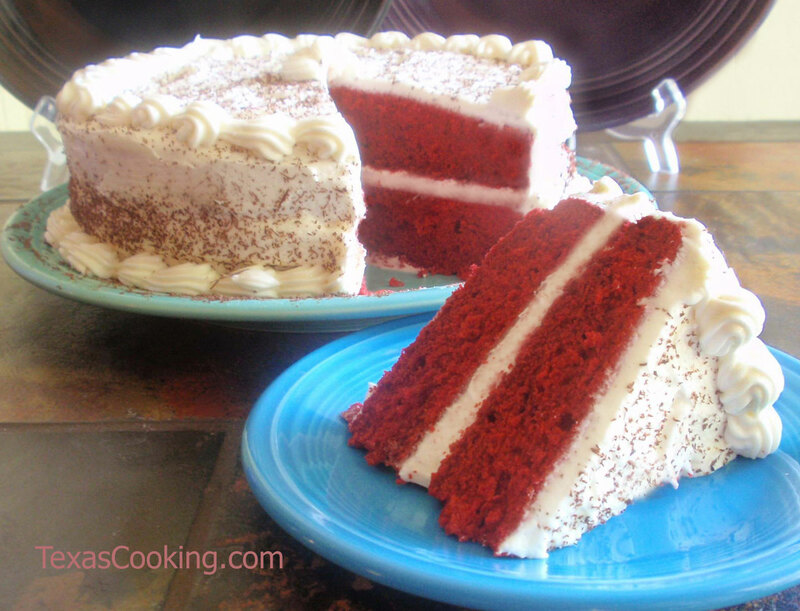 In order to mask its color before the cake is cut and enhance its redness once it is, Red Velvet Cake is traditionally complemented with a thick, very white frosting. Combine the sifted flour and salt, and set aside. Put the cocoa in a small glass bowl, and add the food coloring gradually, stirring until mixture is smooth. Set aside. Cream together the shortening and sugar, beating for 4 or 5 minutes at medium speed in your electric mixer until fluffy. Add the eggs, one at a time, beating for at least 30 seconds after each addition. At low speed of your mixer, add the flour mixture to the sugar mixture alternately with the buttermilk and vanilla, scraping down the sides of the bowl as necessary. Add the cocoa/food coloring mixture, mixing until color of batter is uniform. Do not overbeat; overbeaten cake batter will result in a tough cake. Turn off your mixer. In a small bowl, mix the vinegar with the baking soda. It will foam up. Stir it briefly to mix, and then add it to the cake batter, folding it in to incorporate well, but do not beat. Pour the batter into the prepared cake pans, and bake in a 350°F oven for 25 to 30 minutes, or until a cake tester comes out clean. Allow layers to cool on a rack for 10 minutes before turning out. Let cake cool completely before frosting. Make your cake look pretty. Buy a cake plate from Amazon. Don't be tempted to shorten the shortening/sugar creaming time. Cake texture will be far better, and you can mix up your cocoa and food coloring while the mixer is running. Mixing the cocoa with the food coloring is the best way to get uniform color in the cake. On my first test cake, I sifted the cocoa together with the flour, twice, and still came up with little cocoa-colored whorls in the finished cake. Yes, red food coloring does stain, so use glass utensils rather than plastic. And be careful. The recipes I found on the Internet came up about fifty/fifty as far as the amount of red food coloring they called for -- some with one ounce, the rest with two ounces. Let me just say this: The cake with one ounce of food coloring was a very dark pink. The cake with two ounces (1/4 cup, or 4 tablespoons) was RED. The recipes also varied on the amount of vinegar with some calling for as much as one tablespoon. I found that one teaspoon works just fine. And white vinegar with its less pungent odor is definitely preferable to apple cider vinegar. Most recipes stated that this recipe was suitable for three 8-inch layers and one 9x13-inch cake, but I did not find it to be necessarily so. If you want more than two layers, better to bake two 9-inch layers and split them. A 9x13-inch cake will work, but requires careful testing by the cook after 25 minutes. Combine sugar, cream of tartar, salt and water in heavy saucepan. Cook over medium heat, stirring constantly, until mixture is clear. Cook until mixture reaches 240°F on a candy thermometer (soft ball stage). Beat egg whites until soft peaks form. Let mixer continue to run and slowly pour the sugar mixture in a thin stream down the side of the mixer bowl (don't let the sugar mixture come into contact with the beaters). Continue beating until stiff peaks form and frosting thickens to desired consistency. I admit that this frosting recipe is not the one most often paired with Red Velvet Cake. The traditional recipe begins by cooking a mixture of flour and milk, cooling it, and then whipping in butter, sugar and vanilla. But the resulting frosting, however good it might be, must be refrigerated, and I don't like my cake cold. The above frosting recipe will yield an extravagant amount of lavishly beautiful and delicious white frosting. Now, as for the connection between Red Velvet Cake and the Neiman Marcus cookie hoax goes, back in the pre-Internet Eighties the following little vignette began to circulate. Before you read it, however, let me state in advance that the Neiman Marcus cookie recipe story is completely untrue. Actually, the first time I heard it, the purported villain of the story was Mrs. Field's Cookies. My daughter & I had just finished a salad at Neiman-Marcus Cafe in Dallas & decided to have a small dessert. Because both of us are such cookie lovers, we decided to try the "Neiman-Marcus Cookie". It was so excellent that I asked if they would give me the recipe and the waitress said with a small frown, "I'm afraid not." Well, I said, would you let me buy the recipe? With a cute smile, she said, "Yes." I asked how much, and she responded, "Only two fifty, it's a great deal!" I said with approval, just add it to my tab. Thirty days later, I received my VISA statement from Neiman-Marcus and it was $285.00. I looked again and I remembered I had only spent $9.95 for two salads and about $20.00 for a scarf. As I glanced at the bottom of the statement, it said, "Cookie Recipe - $250.00." That's outrageous!! I called Neiman's Accounting Dept. and told them the waitress said it was "two-fifty," which clearly does not mean "two hundred and fifty dollars" by any *POSSIBLE* interpretation of the phrase. Nieman-Marcus refused to budge. They would not refund my money, because according to them, "What the waitress told you is not our problem. You have already seen the recipe - we absolutely will not refund your money at this point." I explained to her the criminal statutes which govern fraud in Texas, I threatened to refer them to the Better Business Bureau and the State's Attorney General for engaging in fraud. I was basically told, "Do what you want, we don't give a crap, and we're not refunding your money." I waited, thinking of how I could get even, or even try and get any of my money back. I just said, "Okay, you folks got my $250, and now I'm going to have $250.00 worth of fun." I told her that I was going to see to it that every cookie lover in the United States with an e-mail account has a $250.00 cookie recipe from Neiman-Marcus......for free. She replied, "I wish you wouldn't do this." I said, "Well, you should have thought of that before you ripped me off, and slammed down the phone on her. So, here it is!!! Please, please, please pass it on to everyone you can possibly think of. I paid $250 dollars for this... I don't want Neiman-Marcus to *ever* get another penny off of this recipe. Pretty good story, huh? Well, it never happened. Why some people concoct these kinds of stories is as mysterious as why some people are so eager to believe them. This story is not without precedent, though. Back in the 1930's (or the 1940's, depending upon which story you hear), a similar rumor concerning the Waldorf Astoria Hotel circulated like wildfire via post card, letters and word-of-mouth about, you guessed it, their Red Velvet Cake recipe. The circumstances of that rumor were in line with the Forties ($100 supposedly charged for the recipe, no VISA card, no e-mail, etc. ), but the essence was the same. the cookie recipe here, except for the fact that my Internet "research" came up with two different versions. Suffice it to say that both versions were for pretty good sounding chocolate chip cookies. The lesson here is that a healthy amount of skepticism is a good thing to have with you at all times, but particularly when surfing the Internet.